The Stelvio Pass or Stilfserjoch is the site of the highest and oldest summer ski school in Europe, where thousands of skiers have their first experience of the sport, and some of the world's greatest Alpine skiers come to train. 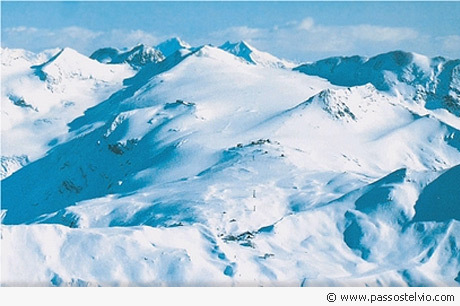 But the Stelvio, which is open from the end of April to the end of November, offers much more than just Alpine skiing. There are three corss-country skiing circuits at the Stelvio, which, though one of the oldest winter sports resorts (the pass opened for summer siing in 1949), now caters for all the new winter sports that are now so popular. The schools give lessons in carving, telemark, freestyle and snowboarding, this latter discipline being offered in a specially created snowpark. There is something quite unique about skiing at the height of the summer. The 20 km of alpine skiing slopes and 15 km of cross-country trails are set against a truly spectacular backdrop o mountain peaks. The lift facilities take skiers to 3400 m, where over 300 insturctors on hand to teach learners of all ages.